Hornbostel–Sachs has no high-level section for percussion. 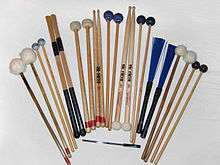 Most percussion instruments (as the term is normally understood) are classified as idiophones and membranophones. 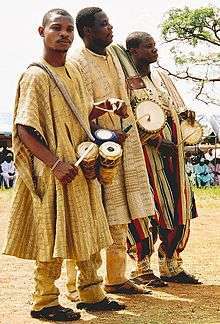 However the term percussion is instead used at lower-levels of the Hornbostel–Sachs hierarchy, including to identify instruments struck with either a non-sonorous object (hand, stick, striker) or against a non-sonorous object (human body, the ground) – as opposed to concussion which refers to instruments in which two or more complementary sonorous parts are struck against each other – and for other purposes, for example: 111.1 Concussion idiophones or clappers, played in pairs and beaten against each other, such as zills and clapsticks. John Cage, Harry Partch, Edgard Varèse, and Peter Schickele, all noted composers, created entire pieces of music using unconventional instruments. Beginning in the early 20th century, perhaps with Ionisation by Edgard Varèse which used air-raid sirens (among other things), composers began to require percussionists to invent or "find" objects to produce the desired sounds and textures. Another example includes the use of a hammer and saw in Penderecki's De Natura Sonoris No. 2. 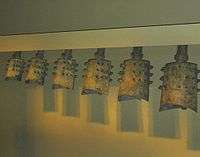 By late 20th century, such instruments had become common in modern percussion ensemble music and popular productions, such as the off-Broadway show, Stomp. Rock band Aerosmith used a number of unconventional instruments in their song Sweet Emotion, including shotguns, brooms, and a sugar bag. The metal band Slipknot is well known for utilizing custom percussion, being that two of the nine pieces in the band are custom percussion. Most of their songs include this custom percussion, which includes hitting wooden baseball bats and other objects on beer kegs to create a distinctive sound. 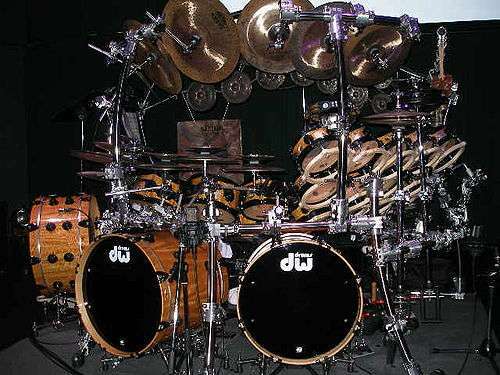 Drummer: a term usually used to describe someone who plays the drumset, hand drums or a single drum such as Snare drum. 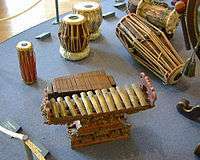 For a list of percussion instrument manufacturing companies, see the categories link down below this article. ↑ "Instruments :: Philharmonia Orchestra". Philharmonia.co.uk. Retrieved 2015-03-30. 1 2 Archived July 4, 2015, at the Wayback Machine. 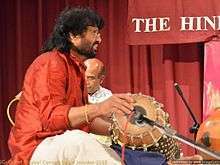 ↑ Note however that percussion instruments such as the xylophone, which share the layout of the piano keyboard but themselves have no keyboard, are termed keyboard percussion and are universally regarded as being within the percussion family. Schick, Steven (May 2006). The Percussionist's Art - Same Bed, Different Dreams. University of Rochester Press. ISBN 978-1-58046-214-3.